In the hot days of summer, I was lucky enough to be one of 35 garden designers spending the day with Tom Stuart Smith. As a garden designer Tom has Chelsea Gold medals and Best in Show for his designs. 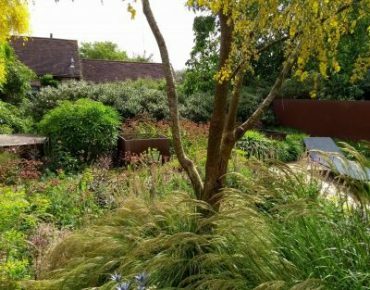 The event was organised by Gillian Goodson in aid of Horatio’s Garden, which creates and cares for gardens at NHS spinal injury centres. Tom spent the whole visit with us, which we weren’t expecting, so we found out a lot about how he created his garden and why he did what he did, as well as what he’d do if he were to start over again – very useful for all of us. He also took us to his sister’s garden across the road at Serge Hill and let us use the natural swimming pond at the end of a hot day, much obliged!! The tanks of Corten steel have inky still water making the place relaxing and contemplative. A large wildflower meadow had just been cut, next to the back of the house. We perched on straw bales to eat our lunch. Beyond the meadow is a wood, and beyond that, a natural swimming pond, where we enjoyed a post-visit plunge. Thank you, Tom! He also showed us round Serge Hill, his sister’s garden across the road – a lovely Edwardian house with a large walled flower and kitchen garden. Both Serge Hill and Tom’s garden, the Barn, open for the NGS – though you’ll have to wait until next year. Worth the wait!